Ind vs Eng: Anushka-Virat’s PDA after India's win is adorable! Virat made an impressive 43 runs out of 29 balls, Rohit Sharma’s century played a huge role in this seven wickets victory for the Team in Blue. It was a proud moment for the country as Virat Kohli-led, Team India won the T20I series against England in Bristol. 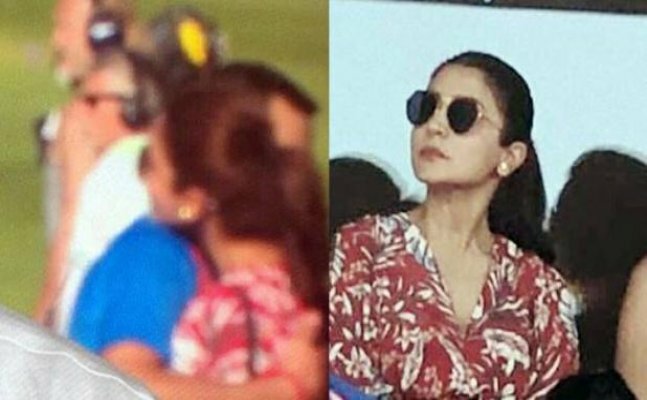 Anushka Sharma, who joined husband in Cardiff, a few days back, also witnessed the match and she made sure to cheer as loud as she could for her hubby Virat. We’ve come across a few pics of Anushka, cheering for Men in Blue from pavilion while sitting with Sakshi Dhoni, Ziva Dhoni. Apart from these pictures, as soon as the match got over, a video of Virat hugging Anushka, who came on the field to greet her husband, made its way to the Internet. Talking about the match, Virat made an impressive 43 runs out of 29 balls, Rohit Sharma’s century played a huge role in this seven wickets victory for the Team in Blue. Two days back, we brought you pictures of Virat and Anushka, who were also a part of MS Dhoni’s birthday, several photos of which were doing the rounds on fan pages of the couple. In one photo, while Dhoni cuts his birthday cake with daughter Ziva and wife Sakshi, Anuska and Virat were clicked in the middle of a conversation. Before that, we brought you pictures of Virushka spotted walking hand-in-hand on the streets of Cardiff. Both Virat and Anushka kept their look pretty casual. Anushka has been going around with Virat in the Indian Cricket Team bus. Pictures of the same went viral too, a couple of days back.